Please accept my humble obeisances. All glories to Srila Prabhupad. All glories to Bhakta George Harrison, who is very dear to His Divine Grace. I would like to share a story about their connection on one occasion in London. I was traveling with Srila Prabhupad, as well as Syamasundar Das and Pradyumna Das, in 1972 (I have a poor memory for dates. I believe this was the year). Syamasundar was instrumental in connecting George with Srila Prabhupad and our movement and had a lot of association with him. They were close friends. I was in the secretary's office, which was more like a large closet off of Prabhupad's quarters, typing letters, when a head popped in the door, and in a very British accent, someone said, "Hello, is Syamasundar here?" I looked over and said that he was out and would be back later. I went back to my typing and then did a double take, as it was George. I got up and went over to him and said that I would tell Prabhupad that he was here. He said, very humbly, "No, no, I don't want to bother him." I assured him that it would not be a bother, and I went into Prabhupad's room to tell him that he was there. Prabhupad immediately said, "Oh! Have him come in." I went back out and told George that he wanted to see him. He was removing his socks and looked over at me and said, "I get so nervous when I am around His Divine Grace." I told him that I felt the same way. He had just shaved his beard and cut his hair back to a Beatle's style, and he said, "I just got my hair cut to see Prabhupad." He was so humble and unassuming. It was like being around a great devotee. It was being around a great devotee. He went into the room and closed the door. I could not stay outside, I had to go in and see the exchange. I opened the door, and George was doing full dandavats and offering both prayers to Prabhupad, with perfect pronunciation. Prabhupad had an ear-to-ear smile. George got up and sat back by the door. Prabhupad said "Come in, come in" and George edged forward towards Prabhupad's desk, very shy and respectful. Prabhupad said "No, here, here" and patted the asana he was sitting on. George came around his desk to the edge of his asana, and Prabhupad reached out and pulled him into his chest, hugging him, laughing, messing up his hair, and saying, "It is so good to see you. How is Pattie?" 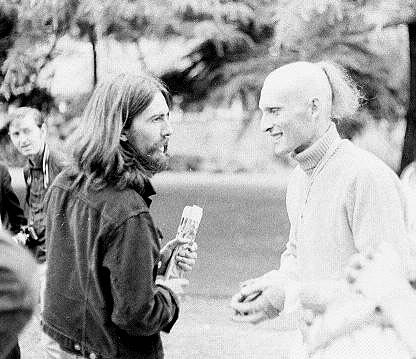 They had a wonderful conversation, where at one point George asked him if he should move into the temple and shave his head. I believe he would have if Prabhupad had said yes. But Prabhupad said emphatically "No! You have a great gift for the world in your music. Just continue your music and Krishna will be greatly pleased and He will bless you." Then he said "I will give you some ideas for your songs" and he got out Srila Bhaktivinode's Songbook and went over a number of the songs, reciting the translations for George. It was soon after this that he wrote "My Sweet Lord." George came daily for a week, along with Ravi Shankar, to have Prabhupad's darsan in the afternoon. Ravi Shankar is a Bengali, so he and Prabhupad talked and laughed together as Bengalis. Of course, Srila Prabhupad's remnants were always a transcendental treasure for all the devotees, and I was blessed to be able to distribute them after His meals. During this week, when I would take the plates away, many of the temple matajis would crowd around, asking "Could I have some of George's remnants, please?" I have remembered this story so many times over the years, with joy and great respect for Bhakta George. He is truly a humble devotee and a great man. I am currently living on Maui, where George had a home, and the stories from the local people are all good. He spread goodness wherever he went. I am greatly honored to have met him on that occasion, and I send him my love. There is no doubt in my mind about where he is now. I hope to see him again. Offered to the Vaishnavas with love and respect.